This Work package will organise and implement decision-making, external and internal communication, administrative and technical control of the project. It will set the basis for coordination of the technical activities of WP2-7 and the interaction of partners, and establish links between project partners and the EU, as well as the ICT community. This Work package will provide the general framework for fixed and mobile networks and assess current evolution trends. It will also identify the requirements and Key Performance Indicators (KPI) for COMBO project that will have to be considered during the FMC network architectures design. This Work package will propose, define and technically assess candidate architectures for future Fixed-Mobile Convergent (FMC) networks. 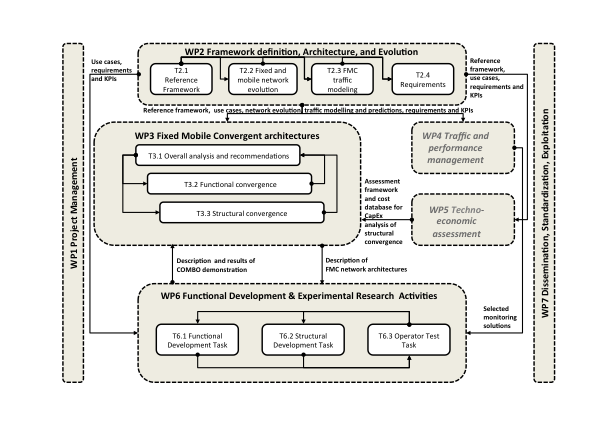 It will compare in detail (pros/cons analysis) the candidate FMC architectures with each other and with the reference framework defined in WP2. This Work package will bring vendors and operators together to demonstrate experimentally varying levels of network convergence identified within the project. This will include development of network functions beyond state of the art in the field of Fixed Mobile Convergence, based on a gap analysis. This Work package will coordinate and perform project results dissemination and exploitation. Particular focus will be on dissemination of the results and proposed FMC concepts towards different standardization and discussion fora. Fore more information, please contact us here!